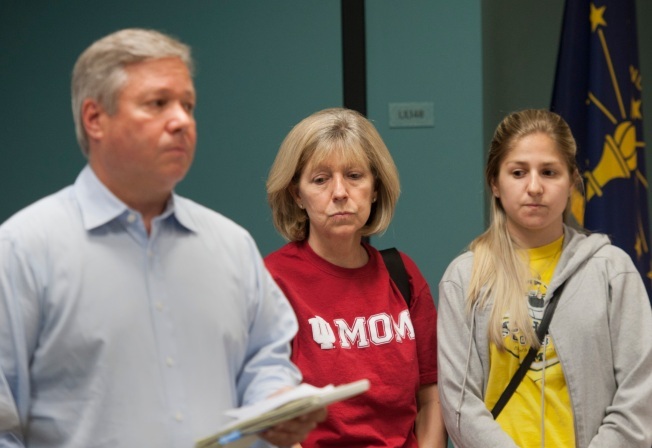 Lauren Spierer's parents, Robert and Charlene and sister Rebecca Spierer, listen as Lt. Bill Parker (not shown) updates media representatives on the search for their daughter, Lauren Spierer. in Bloomington, Ind. The parents of an Indiana University student who was last seen four weeks ago urged the parents of their daughter's friends to help their children "do the right thing" and provide information about their missing child. Robert and Charlene made the emotional plea at a news conference Friday at which they pledged to remain in Bloomington to continue the search for their 20-year-old daughter, Lauren. "Help your children find the courage to come forward," Robert Spierer said, his voice breaking as he addressed the other parents. "Help them find their moral compass. They need your guidance to do the right thing." The Greenburgh, N.Y., woman was last seen about 4:30 a.m. June 3 walking alone toward her downtown Bloomington apartment building after a night of partying with friends. Police this week called off the general searches that had attracted hundreds of volunteers, who scoured the city and parts of the surrounding wooded countryside that is dotted with old limestone quarries and lakes. Bloomington police Capt. Joe Qualters did not provide an update on the investigation at Friday's news conference. Neither he nor the Spierers took questions. The Spierers, who have expressed frustration that only one of their daughter's friends has come forward, said Friday they were thankful for the outpouring of support and prayers they've received from the community since their daughter was reported missing. Robert Spierer said many of those who turned out came day after day, using vacation time or driving long distances to help. Though the volunteer searches have been suspended, Charlene Spierer said she and her husband are "just as determined today as we were day one" to find their daughter. Still, the toll of the past month was evident on both. "I still don't understand what's happened over the past four weeks," Robert Spierer said. "I can tell you that it's our worst nightmare, it's an experience that you don't want anyone to ever have to go through." His wife said his husband was checking his voicemail messages on Thursday and came across an old saved message from their daughter. "Even though I wasn't in the room with him, it was clear it was Lauren. 'Hi Dad, it's me,'" she said. "I just want to say 'Hi Lauren, it's Mom. We love you. We're going nowhere. We're here for you. We just want you to come home.'"